The Student Insurance office is located adjacent to the registration desk in the Medical Clinic on the 2nd floor of the McLane Student Life Center. 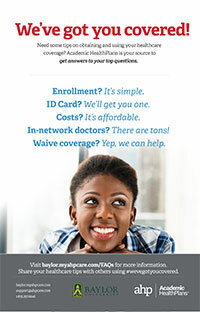 You have available to you the Baylor University Student Health Insurance Plan. The plan is administered by Blue Cross Blue Shield of Texas. The BUHS strongly recommends studentsmaintain adequate health coverage, but services are provided to all Baylor students regardless of their health insurance status. If you do not have health insurance, there will be a charge to visit the BUHS that will be placedonyour student account. HMO, PCP or Tricare PRIMEInsurance Plans-- Contact your Insurance Company for Instructions. We are NOT a Medicare/Medicaid Provider. We will file with any insurance, but you may have higher out of pocket charges if you have HMO/PCP or Tricare Prime.